Hiring in the apartment industry showed no signs of letting up during the third quarter of 2018, according to the most recent edition of the NAAEI Apartment Jobs Snapshot. Openings in the apartment industry comprised 36 percent of positions available in the real estate sector, well above the average of 28.6 percent. Property management positions were in the greatest demand and highly concentrated in cities such as Austin, Portland and Denver. 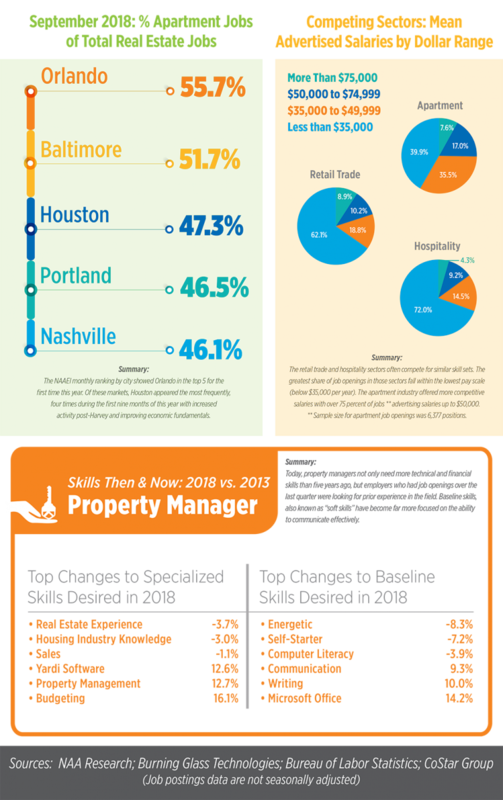 Compared to five years ago, employers are looking for more financial, technical and communications skills in their property managers.